Marketers and analysts are crying foul as Facebook continues to tweak its algorithm that determines what content makes it into the News Feed. 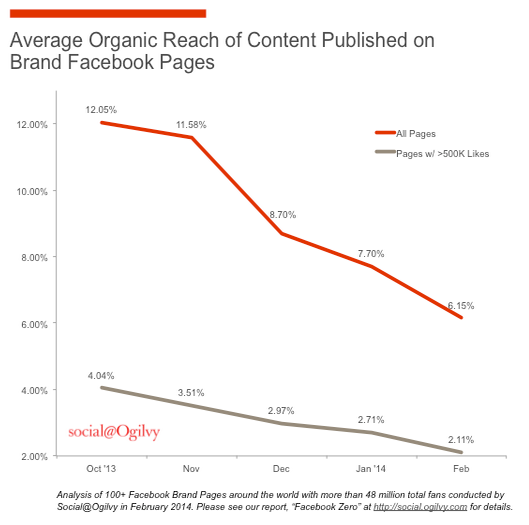 The organic reach of brand pages is now barely hitting 6 percent, but brands expect it to decline even further and faster going forward. Facebook can't be faulted for following the same path as other mass media channels that came before it with regards to advertising, but there are many marketers who are still hoping for something different this time around. Over the past couple weeks numerous reports have surfaced indicating a sharp decline in the organic reach of Facebook posts. The slowdown is nothing new. In a short pitch for ads in April 2012, Facebook calculated the average organic reach of page posts at 16 percent of all fans. So what's changed? A survey last month of more than 100 brand pages by Ogilvy concluded that "it's only a matter of time" before the organic reach of content published by brands is "destined to hit zero." The analysis found that organic reach of those brand pages was hovering at 6 percent, marking a 49 percent decline over a four-month period. The organic reach of brands with more than 500,000 likes was barely hitting 2 percent in February, according to the Social@Ogilvy report. "Right now we're very mad at Facebook," Dave Martin, Ignited's senior vice president of media, said earlier this week at the Mobile Media Summit. "The reason we're so mad at Facebook is because Facebook won't allow us to share content with our followers and fans as we could a week ago." The pay-for-play option isn't exactly paying off in spades either, he says. Now when Ignited purchases ads for its brand clients on Facebook it "takes longer and costs more than it ever has and our engagement scores go down," says Martin. Worse yet, because there's so much uncertainty about the genuine interest of many brands followers, far too many ads are simply "reaching people that don't even care," he adds. "It's become a real nightmare because your fans and likes can't even find you in some cases," Martin says. "When I post to Instagram I have a much better idea of how many people I'm going to reach." The rules have changed and as a result agencies now have to spend more money for their clients on Facebook, says Mike Vaccaro, chief client officer at Digitaria. He says he wants to believe that the ongoing changes to Facebook's algorithm are not driven by financial interests alone. Of course Facebook wants to make as much money as it can, but it also wants to give users the best experience possible, he says. "It's their world and we live in it -- and we have to adapt to it," says Vaccaro. While frustrating, these changes aren't all bad for marketers. The declining organic reach of page posts on Facebook could present agencies and brands with new opportunities elsewhere. On the whole, this is good news for other social networks, says Martin. "I think we're going to kind of see a resurgence" in marketing on other platforms, he says. "We're going to see a lot of advertisers migrating into other channels and testing with more dollars." Because so many changes to Facebook have been met with concern or outright dismay by marketers, one could wonder how fast the sky is really falling now. However, this latest outrage also enjoys the backing of new data from various research firms. "Brands and agencies are now openly talking about their discontent. Every day I talk to brands that are disillusioned with Facebook and are now placing their bets on other social sites," Forrester analyst Nate Elliott writes in a research note. Some marketers are coming to the conclusion that "the paid ads Facebook encourages them to buy often lead to fake' fans generated by like farms,'" he adds. Ignited's Martin shares these concerns. "You can buy fans and followers and likes incredibly cheaply, and the more cheaply you buy them the less they're worth," he says. "That can't be the only thing you're looking at& I'd rather have 1,000 fans that are worth $50 each instead of a million fans that are worth a penny each." The proper response to these changes, according to both analysts and marketers, is to develop a wider social media strategy. The capability to build large communities of engaged fans was a "critical aspect of Facebook's early appeal to marketers" and many brands have invested millions toward that objective, writes Marshall Manson, managing director of Social@Ogilvy for Europe, Africa and the Middle East. "Facebook Zero is a reality now facing every brand and business with a presence on the platform," he adds. "Action is required, and specific decisions will need to be made with regard to content planning, paid support for social media activities, audience targeting and much more."